Several months after September 11, 2001, President George W. Bush detailed $21.4 billion in pledged federal aid to New York City to help rebuild after the attacks on the World Trade Center. Three years later, New York is still grappling with the serious and lasting impact of the attacks. But because of the Bush administration's vague accounting, we do not know how much money we have actually received to date. The total amount of money we will eventually receive is also far from clear. Unfortunately, it is clear that New York State's own poor decisions have made it even harder for New York City to get what it needs from Washington. The Bush administration is required by law to produce a full accounting of this 9/11 aid. Why it has failed to do so adequately is extremely difficult for me to understand. Along with members of the New York Congressional delegation, I have urged the administration on seven separate occasions to detail when and where recovery funds have been used and to clarify what has not been sent to New York from the President's initial pledge. In late May, the White House Office of Management and Budget finally produced an attempted accounting document, but it can be called an "accounting" of 9/11 aid only by Enron standards. There is inadequate detail on where specific funds went for what purposes. In several instances, we don't know when, if ever, these funds were used. The document does not address the $268 million lost to wrongful taxation of 9/11 aid to downtown businesses. It also fails to explain how the administration intends to respond to billions in losses to our region that, at present, remain totally unaddressed. For example, city and state tax revenues lost as a result of 9/11 are estimated at $8.8 billion, for which the federal government has provided no assistance. Nor does it account for a shortfall of about $2.6 billion in "Liberty Zone" Tax benefits. "Liberty Zone" tax benefits made up fully one-fourth of the overall aid package, or about $5 billion, earmarked for New York's recovery by President Bush. These were intended to stimulate economic activity in Lower Manhattan. Now, most officials agree that $2.6 billion Liberty Zone benefits will go unused if Congress and the President fail to extend the deadline for when these benefits can be used, or alter how New York City can take advantage of the funds. Significant gaps in the federal response have made achieving a full economic recovery for New York a serious challenge. From the widest perspective, costs and losses from 9/11 total between $80 billion and $100 billion while federal aid designated for the region remains under $20 billion and insurance payments are estimated to be between $30 billion and $40 billion. This leaves New York alone to shoulder the burden of between $20 billion and $50 billion in losses, in addition to ongoing costs for anti-terrorism security measures, unanticipated long-term health costs from the disaster and increasing costs for rebuilding projects in Lower Manhattan. The city's financial problems go beyond those surrounding the president's $21.4 billion, however. Seeking additional help from Washington is made more difficult by poor decisions on the use of existing funds by New York State. For instance, rather than using current Liberty Bonds for their intended purpose, to help downtown redevelopment, Governor Pataki's administration is diverting $400 million for a power plant in Queens that is opposed by the community. This, even though Congress has said specifically that "public utility property and residential property located outside [Lower Manhattan] cannot be financed with the bonds." Because the Governor has left us no choice, I have joined several elected officials in a lawsuit challenging this misuse of the Liberty Bonds. Federal legislators from around the country will be much less likely to support future requests to help New York's recovery if we don't spend existing resources the way they were meant for use by Congress. 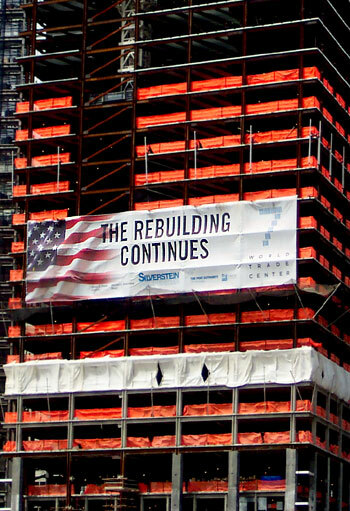 The extensive reform and expansion of Federal Emergency Management Agency's emergency response programs, leading to thousands more New Yorkers made eligible for individual grants and housing assistance after 9/11. Hopefully, our continued advocacy in Washington for New York's remaining recovery needs will lead to additional successes, but we will need a united front, including the governor and the mayor, to achieve much needed and more positive results. Congresswoman Carolyn Maloney represents the 14th District in New York, which includes parts of Manhattan and Queens.